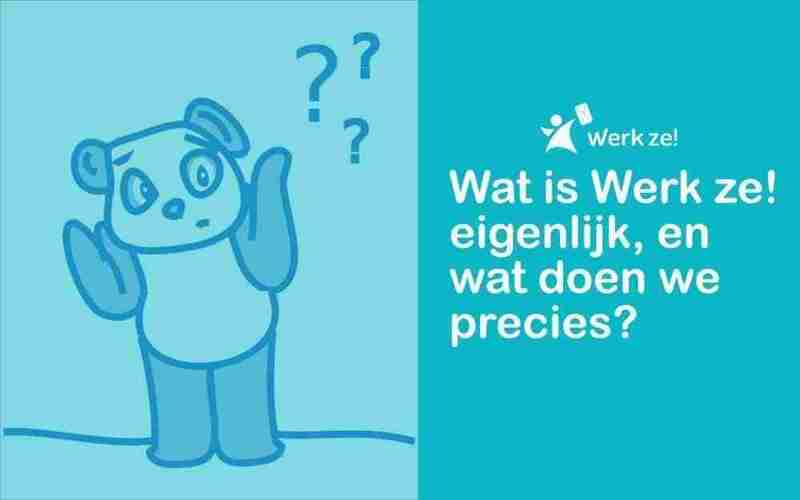 What Is Werk ze! Actually, And What Do We Do Exactly? • Werk ze! Werk ze! is a fairly new organization. So of course, not everyone will know what we do. For this reason, we often get the question, What Werk ze! actually is. And how do you write Werk ze!, is it written as one word? And is the exclamation mark at the end really necessary? These questions I will try to answer in this post. Where does the name Werk ze! come from? You don’t write it as werkze, but as two separate words. The name Werk ze! came out of us wanting to wish you all the best with the next challenge in your professional career. Officially you write the name of our organization with an exclamation mark at the end. Now that you know the meaning of work it! is, we can move on to the next question. What is it exactly? Now that you know the meaning of the name of Werk ze!, we can move on to the next question. What is it exactly? What does it Werk ze! do exactly? Werk ze! is a new digital job board located on Curacao. We provide employers the possibility to post their vacancies on our website and have them be found by jobseekers. At Werk ze! you as candidate can then than search for jobs on Curacao, Aruba, Bonaire, St. Maarten, St. Eustatius and Saba. Internet Job Search is starting to get more popular here on Curacao and the other islands. This is partly to thank to the different Facebook pages, regularly posting local vacancies. Employers can also search our website for candidates to fill their open positions within their organization. This also means that you as a job seeker can leave your resume with us. To make your life easier, you can also create email alerts to get notifications when interesting vacancies are posted on the website. To be able to use this function, you must register as a jobseeker on our website. Vacancies are posted daily for either one of the islands. You’ll only be able to find some of these jobs if you are buying newspapers daily. And suppose you live outside of Curacao and do not have access to local newspapers, then it’s difficult to find these jobs. Werk ze! is handig voor degene die op zoek zijn naar werk in het buitenland. Misschien heb je ooit gedacht om te emigreren naar Aruba om op Aruba te gaan werken. Of wil je vanuit Nederland werk zoeken op Curacao. Dat is nu allemaal makkelijker, want solliciteren gaat ook met één muisklik op Werk ze!. Werk ze! is useful for those who are looking for work from abroad. Perhaps you’ve ever thought to emigrate to Aruba to work in Aruba. Maybe you’re living in the Netherlands and you’re looking for a job in Curacao. That just became easier for you, because our jobs are accessible from wherever you are located in the world and application is just a single click on Werk ze!. This is the reason why Werk ze! is created. Because we wanted to present all jobs on Curacao, Aruba, St. Maarten and the BES islands in an orderly manner. So that anyone, local or international can have access to current jobs on Aruba, Bonaire, Curacao, Saba, St. Eustatius and St. Maarten. Voordeel van zo’n vacaturebank is dat als je alles op één plek hebt en het makkelijk te doorzoeken is. Zo kun je de beschikbare vacatures eenvoudig op locatie, functie etc. sorteren. The advantage of such a job board is that your search will be easier when you have all jobs one place. With us you can easily search by location, function, etc..
We hope you have a better idea of what our organization does and what we can do for you. Do you have a question or want to know more? Please let us know in the comment section below.